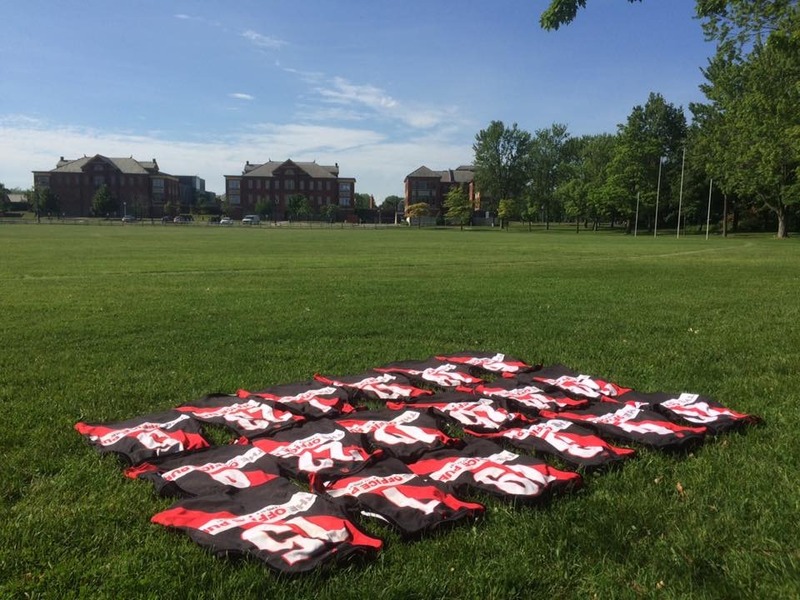 The Toronto Dingos took on the Etobicoke Roos in Friday night football action at Humber South in the annual Ken Gray Memorial Cup game, now in its third year. 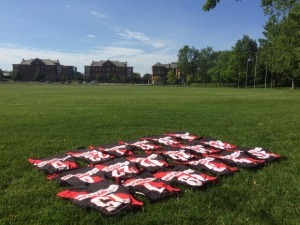 This yearly matchup between the two clubs honours the late Ken Gray, a long time supporter of the Roos and AFL Ontario, and the Dingos were again honored to participate. As is often the case with the Friday night games, the weather was for the most part spectacular and while rain eventually appeared on the horizon it only arrived at the ground after the final siren had sounded. The opening quarter started with the Roos controlling the bulk of the play but captain Mike Bocian was ably assisted in the backline by Alex Cataford and Greg Gilbert in restricting the damage to two majors. At the other end of the field Thomas Santibanez-Espinosa looked dangerous in the few opportunities he was afforded early and was able to score a goal of his own in response. Play in the second quarter was a more balanced affair with Dingos ruckman Tom Bell working well with midfielders Steve Speers, Daniel Gunn and rookie Tim Indian to get the ball moving in the right direction. David Wells, Ricky Nolan, and Canadian rookie Curtis Parker were in turn able to take advantage of the increase in possession. They were able to get several good entries into the forward line, where the always dangerous Thomas was assisted by Stephen Gordon with Everett Wells also floating forward to provide an additional strong target as needed. The Dingos added two goals for the quarter but also squandered some opportunities from free kicks inside 50 that they would rue going into the break. The Roos meanwhile were able to convert their opportunities more efficiently than in the first quarter. With veteran full forward Emile Studham leading the way they added three additional majors of their own. Nonetheless, at the half-time break the game still looked to be in the balance for either team to take control of, with the Roos holding a 5.6-36 to 3.1-19 lead. The Dingos came out from the break feeling confident in themselves but were quickly on the back foot. As is often case, the third quarter proved decisive and while the Dingos found their feet again they struggled to convert what pressure they could amass in the forward 50 adding one major and three behinds. Meanwhile the Roos pulled ahead kicking five majors in building out a comfortable lead. They went into the final break leading the Dingos 10.6-66 to 4.4-28. To their credit the Dingos stuck together and raised their play in the fourth, bringing the game back to the more even play seen earlier. Stephen Donnelly and Patrick Bossey worked hard in the half-back line to push the ball back upfield with Pat eventually following it all the way and picking up the crumbs in the forward 50 to score a well earned goal. Ultimately though the Dingos renewed efforts came too little too late with the Roos always finding a way to immediately punch back. They added four goals to the Dingos three in the final term running out the victors with a final score of 14.6-90 to 7.6-48. Roos player Malcolm Leung took home the shield for the best on ground from either team in the Ken Gray Memorial Cup game. David Wells was named best on ground for the Dingos and was given a bag of sweaty uniforms in lieu of the Paul Tinkler Pewter for his trouble.